This is the mop head you have been looking for. Sweeping, mopping and waiting for the floor to dry can take up to an hour. Why waste time and effort when the PVA Mop will do the work for you? Using the PVA Mop , you can clean up even sticky messes in seconds. 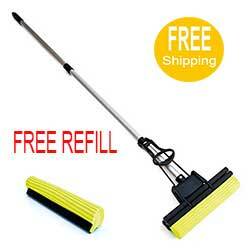 Since the surface of the mop actually attracts dirt, dust and grime, you can mop and sweep all in one easy step. And since it actually dries as it cleans, you’ll eliminate drying time too! This is 100% PVA mop. .
MOP Handle Extents to 59"